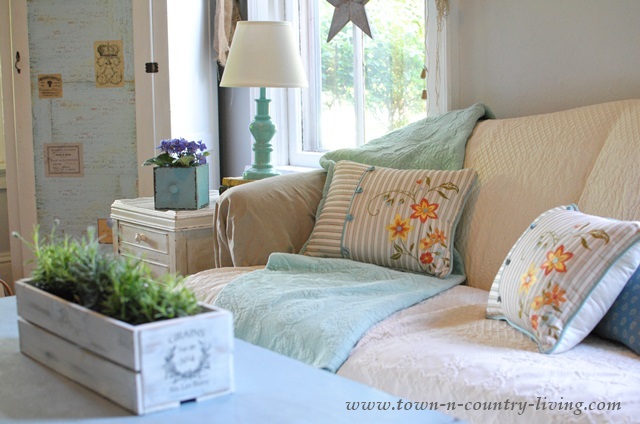 Once summer rolls around I like to lighten up my home decor and this year I’ve been in the mood to add color. I recently added some fun color to my front porch and like it so much better now. The next room to get some fresh summer decorating was my family room. Can you tell the main thing I changed in here? If you guessed the wall clock, you’re absolutely right! It became the inspiration for the rest of the room changes. I spied the large clock at Hobby Lobby … it was half price! I thought the turquoise color would be perfect for summer. I moved the aqua summer blanket from the living room into the family room. The floral pillows are new. I have the hardest time finding pillows I like. Would you believe I found these at Walmart for just $13.99 each? Before I left the store a pair of aqua lamps caught my eye. I’ve been looking for new lamps for this room for awhile now. These were the perfect summer decorating solution for my family room. 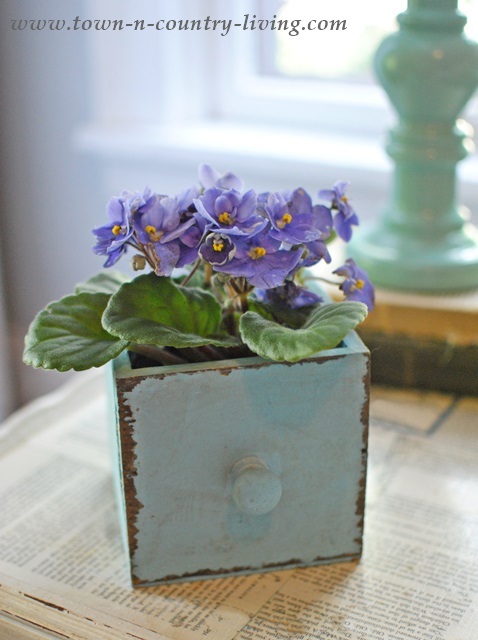 Keeping with the blue theme, I tucked a pretty violet inside a painted miniature drawer. 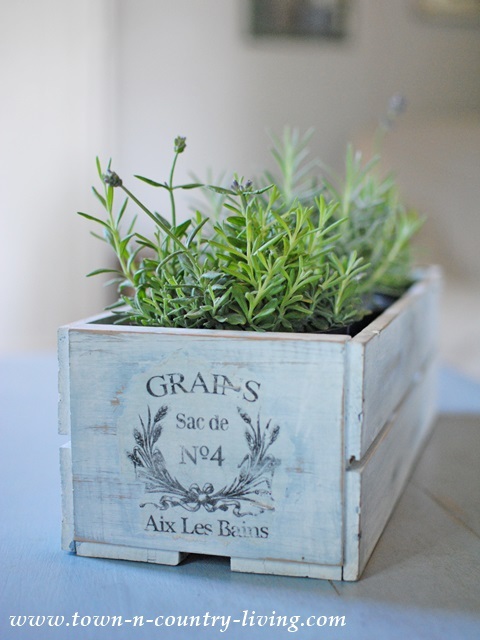 And on the coffee table, I placed lavender in my little French crate. The lavender smells wonderful and I love the way it looks in this little crate. I painted this French crate and added the graphic a couple years ago. and the corner armoire cabinet has been painted and decoupaged. I’m really happy with the new clock … I like it much better than the old clock. It’s nice when you find an inspiration piece that sets everything in motion! I’m still looking for a new sofa for this room though. I love large clocks and that is a great color on that one. I usually find too many pillows I like and have to make myself not buy them. 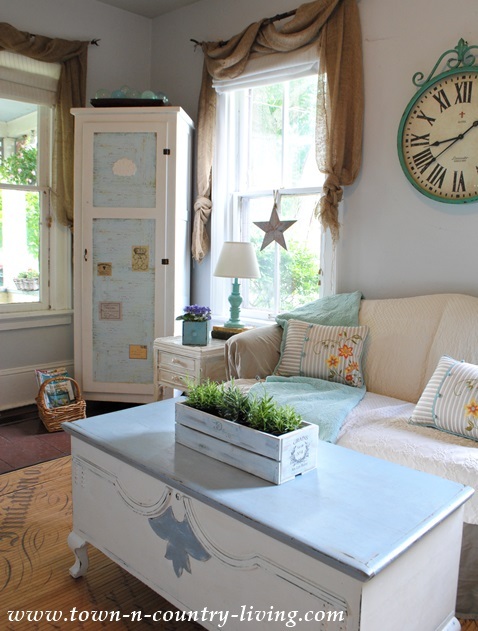 The touches of aqua gives your family room such a pretty fresh look for summer. Your living room is gorgeous. Love that violet tucked in the drawer. 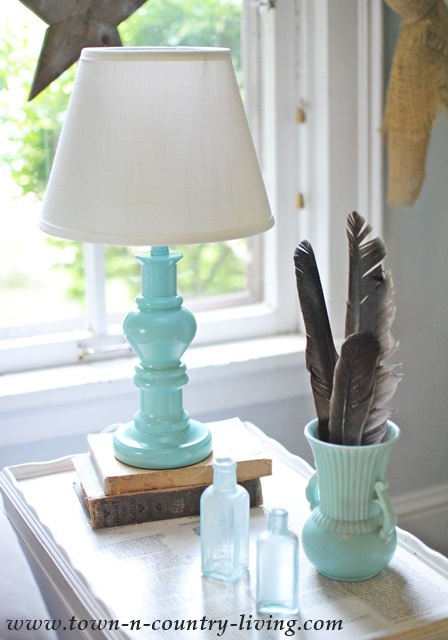 And that photo of the new lamp and vase of feathers is awesome. Love it all. May have to run to Walmart! It all looks beautiful Jennifer. Fresh and summery. Absolutely charming! Your eye for color and savvy shopping are a winning combination for a great Summer look! So pretty. 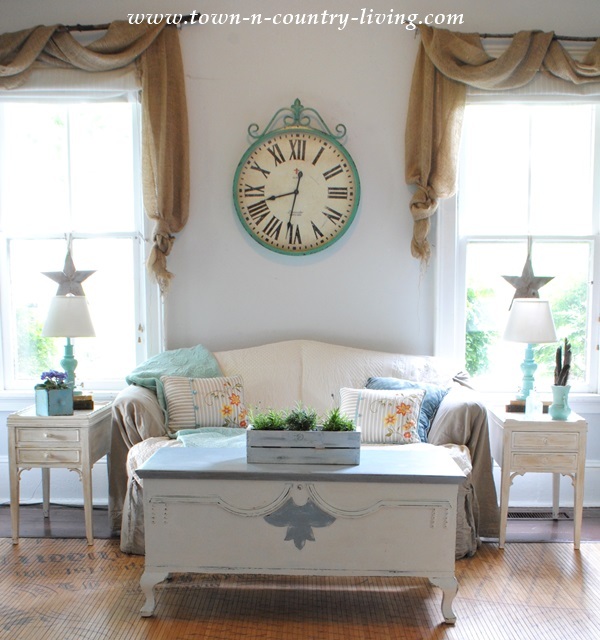 I love the new clock and the touches of blue throughout the room. So bright and cheery for summer. I am in love with that clock! It’s perfect for your room! And, I can’t believe you got the pretty pillows and lamps at Walmart! Great finds! 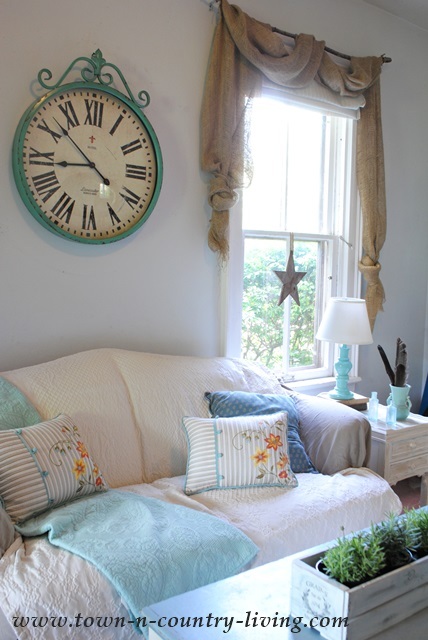 That is such a cool clock…I am adding touches of this shade of blue to my neutral living room, too. I definitely says Summer!! Jennifer as soon as I saw that clock I knew. 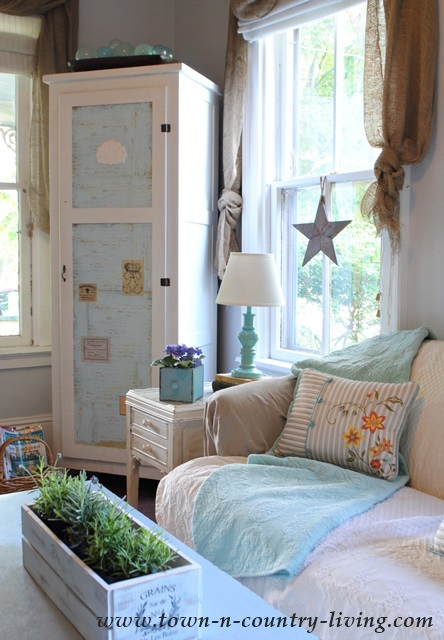 It is so pretty and I love the colors you used in this room. I love the aqua colors you selected, Beautiful summer colors for this room. Oh yes, love the clock from Hobby Lobby at half price and all the goodies from Walmart. It is lovely! And, yes, I knew right away it was the clock 🙂 I just love the stars in your windows, glad you kept them!! Love the clock, Jennifer! I can’t tear myself away from the clocks at Hobby Lobby ~ I want one of all of them! : ) Your room looks great. Love the throw and the lamps, too. I LOVE everything about this room. It looks so inviting! I absolutely LOVE those pillows. I must get me some. Thanks for sharing your beautiful room. Wow, your room looks great, Jennifer!!! I don’t have anything against Walmart — but it’s sort of hit or miss for me. Sometimes I find a lot of cool things, and other times… well, I just don’t. You really lucked out. 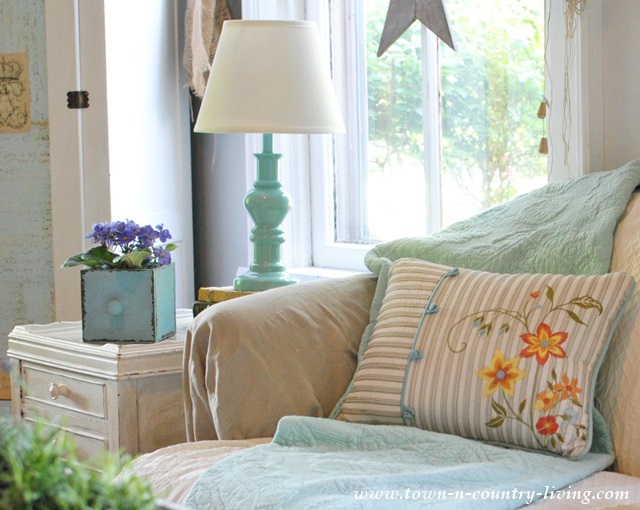 Those pillows & lamps are perfect for your room! 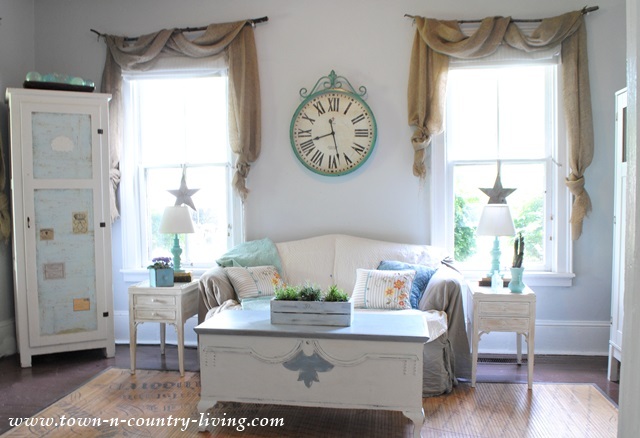 LOVE that clock Jennifer…..works beautifully in your room! I love the burlap swags. Can you tell me how you made them, measurements etc. Is it just regular burlap, like you would find at Hobby Lobby? Beautiful home, love it.